With approximately 27,000 students enrolled at three campuses in Selden, Brentwood and Riverhead, Suffolk County Community College is the largest community college in New York State. We offer Associate in Arts (A.A.), Associate in Science (A.S.), and Associate in Applied Science (A.A.S.) degrees and professional certificates in 100 programs of study. We encourage you to learn more about all of our educational opportunities, as well as our recognized athletics programs, student clubs, organizations and support services. What does it mean to be a Shark? It means passion, family, quality, teamwork, and success. Suffolk's athletic teams have been the proud winners of six national championships and four regional championships. In the 2013 to 2014 academic year, seven athletes have been honored with placement on the NJCAA Academic All-American team, while maintaining a GPA of 3.8 and higher, and two coaches have been the recipients of the Metropolitan Referees Sportsmanship Award. 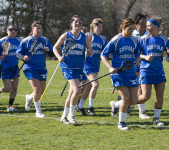 Hear as student athletes and their coaches express, in their own words, their pride in the Suffolk athletic program. Edited by Mary Ayers, Radio & Television intern. Through its diverse programs, three campuses and talented faculty, Suffolk County Community College prides itself in cultivating incredible students who will become tomorrow's leaders. Congratulations to the Suffolk County Community College Class of 2016! This video explores the transformation of several Get There From Here scholarship recipients and their success. Scholarship recipients give advice on how to prepare and succeed in applying for the SOLII scholarship. Suffolk County Community College student leaders spend a weekend on Shelter Island developing leadership skills and self confidence. Three videos tell the story from different perspectives. Suffolk County Community College student leaders reflect on their involvement in activities outside of the classroom and the impact those experiences have had on their learning experience.